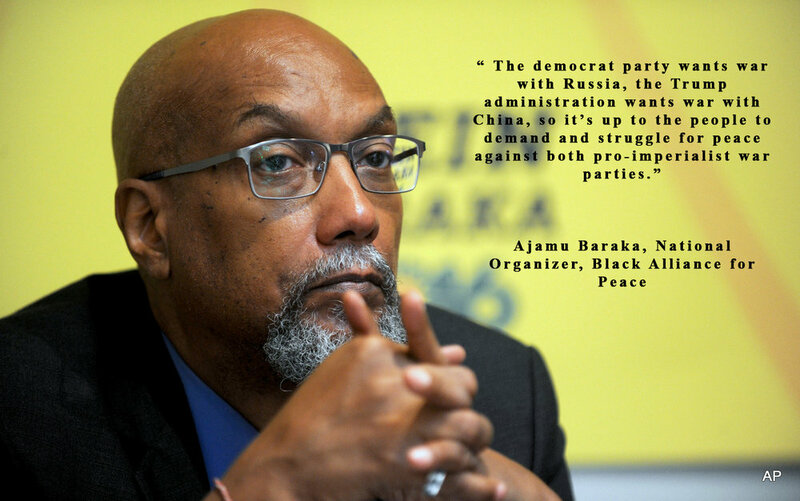 The Black Alliance for Peace (BAP) seeks to recapture and redevelop the historic anti-war, anti-imperialist, and pro-peace positions of the radical black movement. Through educational activities, organizing and movement support, organizations and individuals in the Alliance will work to oppose both militarized domestic state repression, and the policies of de-stabilization, subversion and permanent war agenda of the U.S. state globally. As descendants of Africa, still recalling the sting of the driver's lash borne by our foremothers and forefathers, the kidnapping, the trade, we are the casualties of imperialist wars and domestic terrorism. The Black radical voice must ground itself in the movement to end wars across the globe and boldly speak out against repression and the rise of fascism in all its many forms. There must be an alternative to the neoliberalism of the Democrats and the nationalist-populism of Trump. We need an independent movement to address both the economic needs of poor and working people and the escalating attacks on the Black community, immigrants, women, unions, the LGBTQ community, refugees, Muslims, the physically and mentally challenged, youth, students, the elderly, Mother Earth - all of us. We need a new movement to end the wars on black people and people around the world. The BAP is a significant step toward helping to revive the anti-war, anti-imperialist and anti-state-repression movement in the U.S. Let us on this 50th anniversary re-dedicate ourselves to building a movement for social justice that rejects the de-humanizing effects of war on everyone.